BMW 6 Series Gran Coupe 2013 is a new 4-door, 4+1 seat addition to the 6 Series line that successfully combines the stunning proportions, design and driving dynamics of the 6 Series Coupe with interior room and amenities for up to five passengers. The BMW 6 Series Gran Coupe will be offered as three distinct models in the USA. The TwinPower Turbo 6-cylinder powered 2013 BMW 640i Gran Coupe is the initial model and arrives early in summer 2012. 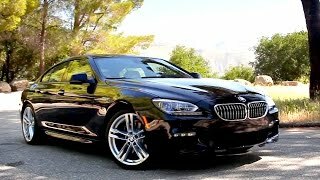 Later in the summer, the TwinPower Turbo V-8 powered 2013 BMW 650i Gran Coupe and the all-wheel drive 2013 BMW 650i xDrive Gran Coupe will join the range. 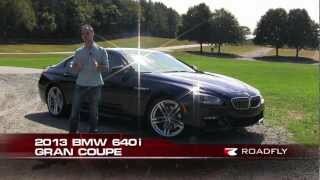 Woodcliff Lake, NJ – December 11, 2011 6:00 pm EST … Introducing the BMW 6 Series Gran Coupe – a new 4-door, 4+1 seat addition to the 6 Series line that successfully combines the stunning proportions, design and driving dynamics of the 6 Series Coupe with interior room and amenities for up to five passengers. Harmonious proportions, precise lines and sleekly contoured surfaces give the BMW 6 Series Gran Coupe the unique ability to satisfy the driver who wants a luxurious and sporty coupe yet needs a car capable of carrying four adults in comfort and luxury. The BMW 6 Series Gran Coupe will be offered as three distinct models in the USA. 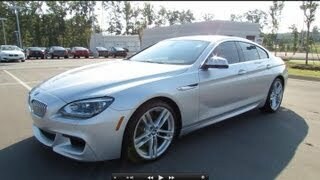 The TwinPower Turbo 6-cylinder powered 2013 BMW 640i Gran Coupe is the initial model and arrives early this summer. 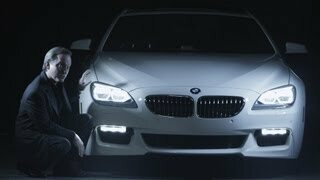 Later in the summer, the TwinPower Turbo V-8 powered 2013 BMW 650i Gran Coupe and the all-wheel drive 2013 BMW 650i xDrive Gran Coupe will join the range. Sporting a length of 197 inches (5,007mm) and wheelbase of 116.8 inches (2,968 mm), the Gran Coupe is 4.4 inches (111mm) longer than its 2-door coupe sibling. A significant part of this extra length has been used to enhance seating comfort for the rear passengers. 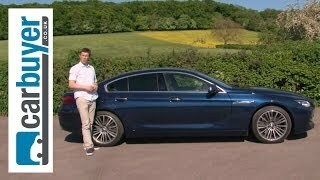 The BMW 6 Series Gran Coupe is also 74.6 inches (1,894 mm) wide and stands 54.8 inches (1,392mm) in height. For comparison purposes, the Gran Coupe is 4.0 inches (102mm) longer, 1.3 inches (34mm) wider and 2.8 inches (72mm) lower than the BMW 550i. Its unmistakable design language gives the new BMW 6 Series Gran Coupe an aura of athletic elegance. The long powerfully contoured hood, short front overhang and set-back passenger compartment team up with a 4.4 inch (111mm) increase in body length over the 6 Series Coupe and a 4.5 inch (113 mm) longer wheelbase present a fresh take on the hallmark proportions of a BMW automobile. The Gran Coupe’s distinctive profile is dominated by its four-door, elegantly stretched roof line which flows smoothly into the rear end, is a similarly eye-catching and distinctive feature of the new model’s silhouette. The 4.4-liter V-8 engine (N63) that powers the current 650i models receives an upgrade for the new 650i Gran Coupe. The unique “reverse-flow” engine, whose two turbochargers are positioned in the V-area between the cylinder banks is well known for producing an instantaneous and sustained wave of power, making it a delight for the enthusiast driver. This new version of the engine adds BMW’s VALVETRONIC variable valve timing to the list of specifications. As a result, the new version of the engine (N63Tü) develops a maximum 445hp between 5,500 and 6,000rpm (a 45 hp increase), and makes peak torque of 480 lb-ft between 2,000 and 4,500rpm (a 30 lbs-ft increase). When the V8 is combined with the xDrive intelligent all-wheel-drive system, its power is converted into even more intense and dynamic acceleration. The electronically controlled power split between the front and rear wheels optimizes not only traction and stability, whatever the weather and road surface conditions may be, but also the agility of the Gran Coupe 650ixDrive Gran Coupe, whose sprint time from 0 to 100 km/h (62 mph) is just 4.5 seconds. The electronically controlled damper system in the new BMW 6 Series Gran Coupe adjusts compression and rebound settings continuously and independently. For example, a stiff chassis setting can be combined with comfortable responses to unevenness in the road surface. The control unit of the damping system processes the data supplied by sensors on the vertical motion of the wheels as well as the ride height of the car. The driving speed and the damper setting chosen by the driver are also taken into account in calculating the damping force required for each individual wheel to even out body movements. This data is fed back to the shock-absorber units at intervals of just 2.5milliseconds. An M Sport package developed specially for the BMW 6 Series Gran Coupe is available from the launch of the new car. Among the features included are an M aerodynamics package with uniquely designed front fascia, side skirts and rear fascia. The M Sport package also includes exhaust tips in black chrome, black-painted brake callipers, LED foglamps, a sports exhaust system for the BMW 650i Gran Coupe and 19-inch light-alloy wheels in M double-spoke design. 20-inch light-alloy wheels in Mdouble-spoke design are also available as a package upgrade. Customers ordering the M Sport package may also opt for the Mpaint finishes Carbon Black metallic and Imola Red non-metallic. The sporting theme continues inside the car in the form of special MAlcantara/leather sports seats with blue contrast stitching, an Mleather steering wheel with multifunction buttons and gearshift paddles, and aluminium hexagon interior trim. Plus, the M Sport package adds door sill finishers sporting the Mlogo and an Mdriver’s footrest to the mix.